was driven by a storm onto the Albanian coast. members are descendants of the Greek Jews living in the Byzantine Empire. of Epirus and the jewish community suffered from persecutions. issued by Emperor Andronicus II Palaeologus (1282-1328). During his reign the emperor placed the Jews under his direct protection. population was 3,000, and on the eve of the Holocaust it was 1,950.
had dwindled to 92. By the 1990's only approximately 45 remained. fishermen, and coachmen among them. "Megali Rouga", which means "Big Road". (Demotic Greek) and Yanya (Turkish). just after the destruction of the Second Temple in Jerusalem in 7OCE. surrounding the building and its courtyard were built in the late 19th century. to the balcony; the seating arrangement is along the central axis, east-west. and it was razed around the end of the war. on the site on Joseph Eliyia Street. donated by the  janina jewish community. forming a minyan group to perpetuate their heritage and traditions. The second important facet to the community was a burial society. United Brotherhood/Good Hope Society of Janina. yet it's polar-axial is north-south and not the traditional east-west. War II and the Holocaust, who helped augment our congregation once again. congregation, led by President Hy Genee, conducts its own service. of Italy into Epirus from Albania in 1940, the country had no choice. another story in the Bulgarian and German sectors. In trying to "Bulgarize"
extermination of Greek Jewry began its final phase. in Athens and by rail north to Auschwitz. Athens gained in numbers after the war as victims returned to the capital. slightly different since they hadn't included  some of the cities. 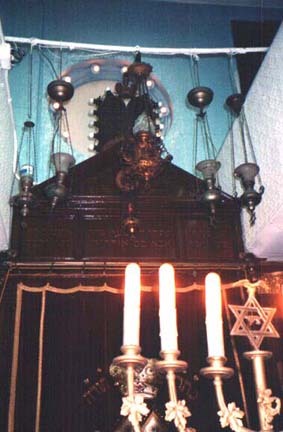 Chanukaria (menorah)  and chanukaria (candles). 2)It contains elements of Aramaic and later, Turkish. 3)It was written with Hebrew characters. World War II, spoke standard Greek with a Hebrew influence. "Yanniotika Evraika Traghoudhia" compiled by Joseph Matsas. 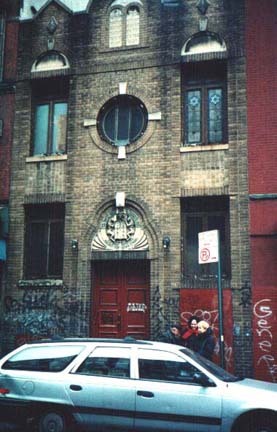 (the only Romaniote Synagogue in America). 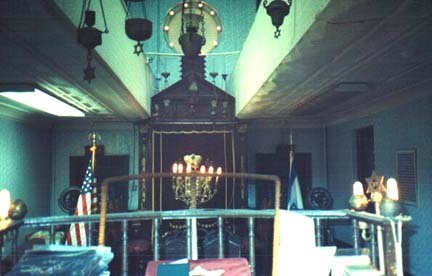 3) A view of the Ark. perished at the hands of the Nazis. transported to the concentration camps. People know little of the Holocaust that engulfed Greece. undertold story. Books will be available for purchase. and Museum at (212) 431-1619.